Confused and confounded by lists of origins? New to high-end coffee and don’t know where to start? Want someone to pamper you by creating a blend just for you? You can keep trying different single origins (really kind of fun) until you find something you really like, then build on it. You can take our Coffee Preference Profile© (pdf file at the bottom of this page) and request a custom blend that meets your specifications. Please complete a separate Profile sheet for each custom blend you think you might want. We’ll keep it on file, and you can tweak it as you refine your tastes. You can contact us for a personal consult at no charge. I can talk you through the process in about 10 minutes and understand your desires more deeply. Who knows? It could be fun, too. What does it cost to have a custom blend just for me? Custom blends generally cost about the same (ok, about a dollar or so higher or lower) as the single origins, but because we are making a recipe just for you, we will quote you once we have your specifications. Do you really name it for me? Yes. Further, I will keep your unique recipe in my database so that you can either order it again or use it as a basis for a desired tweak. For example, you tried “X’s personal espresso blend”, but this time you want it to have more bittersweet chocolate and less complexity. I would tweak the recipe and record it, too, for future reference as “X’s personal espresso blend #2”. We really do treat you like our only customer. What if I want more than one custom blend? That’s fine. We all want variety in our lives, so if you want, say, a fruity light roast and a dark, dark “noir” Indo profile blend, just fill out two forms, one for each. Submit scans or photos of your forms on our Contact Us page or email to Nano.Roast@gmail.com. Will my personal blend taste exactly the same every time? Probably not exactly. Coffee is an agricultural commodity whose characteristics vary a bit depending on a lot of factors, including weather, handling, etc. that happen far upstream from NanoRoast. However, I will attempt to be as faithful to the taste profile you said you wanted as possible, even if that means using a different origin bean. I don’t expect the final product to vary a great deal from time to time, but if you are disappointed, please contact me and I’ll work with you within the NanoRoast Purchase Happiness Policy (please read it). Do customers really do this, and are they happy? —From Mr. PickyPants: ” I thought I was going to have to roast my own to get it the way I like, but wow, Susan kept at it until it was perfect for me! I’m hooked! Important How to Buy from NanoRoast Information is here. Please read it. 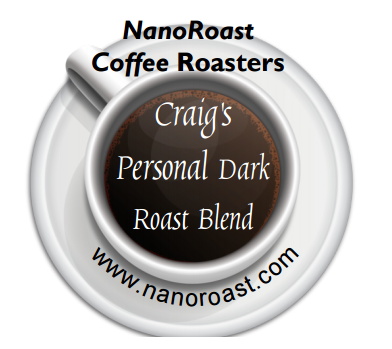 Download and fill in the preference form below, then scan/photo and upload via the Contact Us page or email to Nano.Roast@gmail.com. All information collected will be kept confidential and used only to help you find your favorite custom blend. Remember, we need one for each custom blend you want to register. Enjoy!